MISSISSAUGA, ON, Aug. 14 /CNW/ – Phonetime Inc. (TSX: PHD), a leading global supplier of international long distance telecommunication services, today reported its financial results for the three and six month periods ended June 30, 2009. All figures are in Canadian currency. Consolidated revenue for the second quarter ended June 30, 2009 was $41.3 million, representing an increase of 5% when compared to $39.3 million for the second quarter of 2008. For the six month period of 2009, Phonetime’s revenue was $83.9 million, up 11% from $75.8 million for the same period of 2008. The growth is chiefly due to higher sales volumes of the Company’s Wholesale Division, which buys and resells telecommunications long-distance services to telephone carriers around the world using Phonetime’s proprietary call trading platform. Phonetime also generates revenues through its Consumer Division, which provides pre-paid calling cards and long-distance services to targeted ethnic consumer groups across Canada. Phonetime currently has more than 125,000 customers using its long-distance retail services. On a segmented basis, Wholesale Division revenue for Q2 2009 was $39.3 million while Consumer Division revenue was $8.8 million prior to inter-segment eliminations of $6.9 million. This compares respectively to $42.8 million and $8.0 million prior to inter-segment eliminations of $8.2 million for Q1 2009. Total number of international long-distance minutes processed by both the Wholesale and Consumer Divisions for Q2 2009 grew by 14% over the same period in 2008. Gross profit for the second quarter of 2009 was $5.1 million or 12.3% of sales compared to $5.2 million or 13.2% of sales for the second quarter of 2008. The year-over-year decrease was principally due to higher cost of sales as a result of a decline in the value of the Canadian currency against the U.S. dollar, which chiefly impacted the high margin Consumer Division. On a year-to-date basis, gross profit for 2009 was $10.9 million compared to $10.1 million for 2008. Phonetime generated operating income of $0.9 million for the second quarter of 2009, down from $1.8 million for the second quarter of 2008. 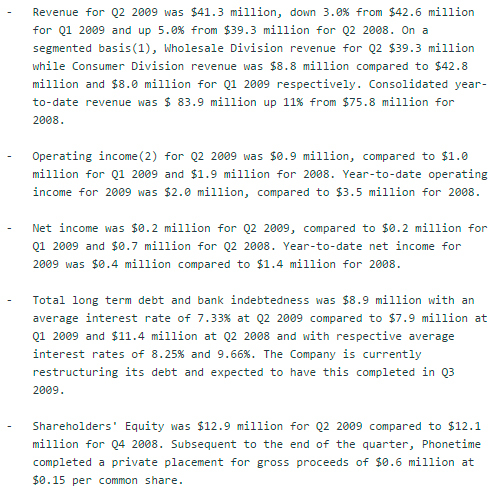 For the first six months of 2009, operating income was $2.0 million, down from $3.6 million of 2008. The year-over-year decrease is attributable to a number of higher operating costs, which were paid primarily in U.S. dollars, including increased marketing costs stemming from promotional and trade show events, increased professional services fees relating to legal, audit and financing activities, increased salaries due to a growth in the number of international sales representatives, and new investments to support the Company’s continued expansion in Hong Kong. Sequentially, Phonetime’s operating costs have been reduced from the first quarter of 2009 by $0.6 million. Income before taxes for the second quarter of 2009 was $0.2 million compared to $1.1 million for the second quarter of 2008. On a year-to-date basis, income before taxes for 2009 was $0.8 million compared to $2.1 million for 2008. 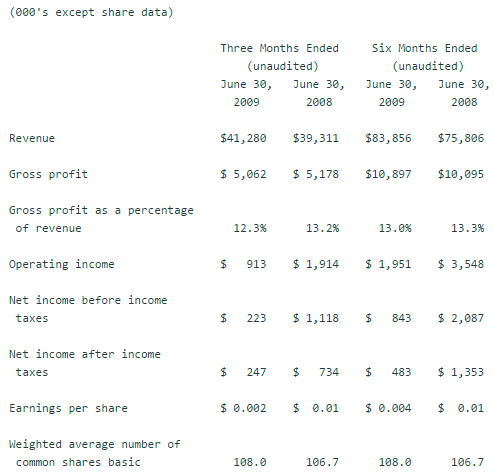 Net income after taxes for Q2 2009 was $0.2 million or $0.00 per basic share after a nominal tax recovery was recorded. This compared to $0.7 million or $0.01 per basic share for Q2 2008. For the six month period of 2009, net income after taxes was $0.5 million, compared to $1.4 million for 2008. As at June 30, 2009, Phonetime held cash and short-term investments of $0.03 million as well as accounts receivable of $11.1 million. Subsequent to quarter end, Phonetime completed a private placement that raised gross proceeds of $0.6 million through the sale of units, consisting of common shares and warrants. The funds will be used primarily for working capital purposes. Phonetime will file its consolidated financial statements for the second quarter 2009 and related management’s discussion and analysis with securities regulatory authorities within the applicable timelines. The material will be available through SEDAR at www.sedar.com and the Company’s website, www.phonetime.com. Phonetime will host a conference call to discuss its 2009 second quarter financial results on Monday, August 17 at 4:00 p.m. (ET). To access the conference call by telephone, dial 416-644-3419 or 1-800-731-5319. Please connect approximately 15 minutes prior to the beginning of the call to ensure participation. The conference call will be archived for replay until Monday, August 24, 2008 at midnight. To access the archived conference call, dial 416-640-1917 or 1-877-289-8525 and enter the reservation number 21313132 followed by the number sign.